Pumpkin spice drinks are huge in coffee shops this time of year, and coffee is a flavor that goes very well with pumpkin. Tea, however, can be an even better match for those distinctive pumpkin pie spices and it is a shame that you won’t see more pumpkin spice tea drinks on those menu boards. Fortunately, they are easy to make at home as long as you have some tea, milk and pumpkin spice syrup on hand. You can buy a bottle of Pumpkin Spice Syrup from companies like Torani and keep them at home so that you can easily add a hint of pumpkin spice to any coffee and tea drinks during the holidays. I prefer to make my own syrup so that I know it is all natural and contains just the right blend of spices that I like. I start my drinks with a spicy, flavorful tea. Rooibus teas often work very well, as chai chai teas, though they give you a very strong spice baseline to build upon. I sweeten the tea with my pumpkin spice syrup, top it with steamed milk and serve. In a large mug, combine tea with pumpkin spice syrup, adding more to taste if necessary. Stir well to combine. 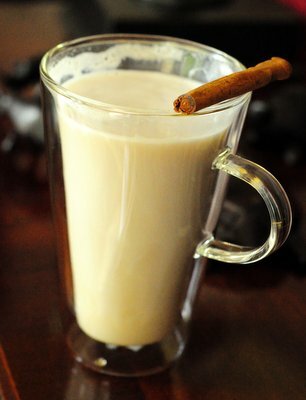 Top with steamed milk and sprinkle with cinnamon or pumpkin pie spice to garnish.